In general, news stories are organized using the inverted pyramid style, in which information is presented in descending order of importance. This allows the audience to read the most crucial details quickly so they can decide whether to continue or stop reading the story. From an editing perspective, using the inverted pyramid style makes it easier to cut a story from the bottom, if necessary. 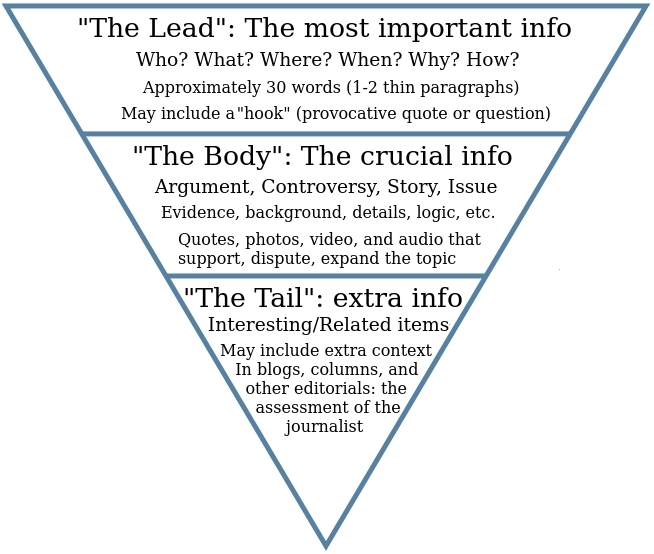 Invented more than a century ago, the inverted pyramid style remains the basic formula for news writing (Scanlan, 2003). It is important to note that some news stories do not strictly follow the inverted pyramid style, although the lead for a hard news piece always does. Furthermore, not everyone in the journalism field embraces the style; some detractors believe it is an unnatural way to engage in storytelling and present news to the public. Yet, proponents believe it is an efficient way to organize and share information in a fast-paced society (Scanlan, 2003). Therefore, it’s important for students to learn the style; one good way to do so is to regularly read hard news stories and pay attention to how the leads are structured. The lead (also known as the summary lead) and the body of the inverted pyramid style are discussed in the next sections.